An export is used for extracting the data saved in the MSSQL database. Both selective (manual) and automated system tasks can extract information from Password Safe in this manner. !Please note that extracting passwords is always associated with a weakening of the security concept. The informative value of the “logbook “https://help.passwordsafe.de/v8/1/en/topic/logbuch will suffer when data is exported because the revision of this data will no longer be logged. This aspect needs to be taken into account particularly in conjunction with the Password Safe export wizard because the export result is not separately secured by a password. The export function is accessed via the Main menu/Export. 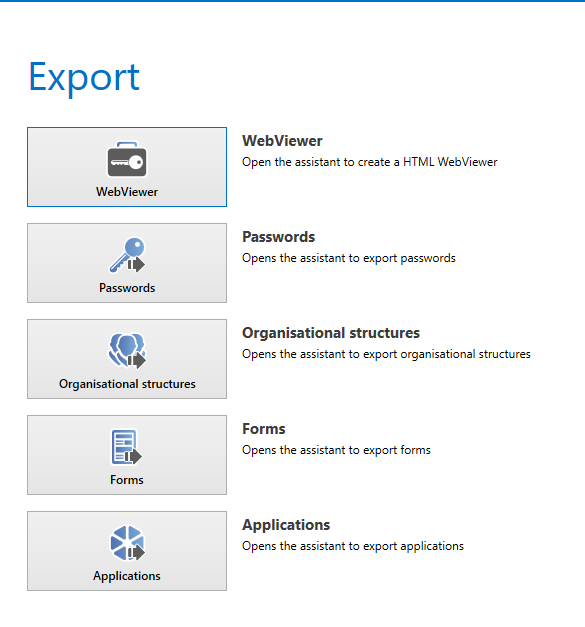 There are two fundamental types of export – the WebViewer export and the export wizard. However, the latter is divided into four subcategories. The WebViewer export creates a HTML file protected by a password. In contrast, the export wizard creates an open and unprotected .csv file. In this example, the marked role IT employee does not have the required permissions to export the record. In contrast, the IT manager does have the required permissions. In addition, the administrator possesses all rights, including the right to export. The following option is required. *If a record is exported, this user right and also the corresponding permissions for the record must be set. The user right defines whether a user can generally export data, while the permissions for the record define which records can be exported.